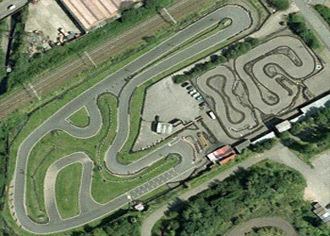 One of the best go kart tracks in the west midlands, Birmingham Wheels is a must for outdoor karting enthusiasts. Just a mile from the City centre the venue is home to a Junior Circuit, GP National circuit (750m) and the full International circuits (970m) for adults. Circuit is open seven days a week, is fully floodlit and has catering facilities on site. The karts used are 270cc GT3 ThunderKarts for adults and restricted cadet karts for the youngsters. The track will run arrive-and-drive for small groups as well as full blown corporate events for up to 400 guests. Leave the M6 at Junction 6 and follow pick up the A38M (Aston Expressway) towards the centre of Birmingham. After a short section of Motorway, turn left onto the A4540 off the roundabout at Dartmoor circus. If you are heading from the centre of Birmingham then you turn RIGHT at this roundabout. This road is called Lawley Middleway and you follow this road, go over two roundabouts and then turn left into Landor Street. Go down this road and take the second right that is Alderley Road South. Follow the signs for the circuit from here. For groups of 10 - 20 drivers: 10 minutes qualifying followed by a non-stop 50-minute solo endurance using the International Circuit. For groups of 10 - 20 drivers: A 10 minute Practice session followed by two x 20 minute races on the International circuit. Exclusive use of the Junior circuit for 1 hour. All kit and equipment supplied. Prices start at £132.00 for up to 8 drivers using 2 junior karts or £180 for up to 12 drivers using 3 junior karts. Exclusive use of the GP circuit for 1 hour. All kit and equipment supplied. Prices start at £198.00 for up to 8 drivers using 2 cadet karts or £288 for up to 16 drivers using 4 cadet karts. The venue has 3 specific cadet/junior karts. There are conference facilities for 60.